Situated in Agra and located only 600 metres from the Taj Mahal, The Oberoi Amarvilas is a quiet and peaceful haven set away from the bustle of the city. 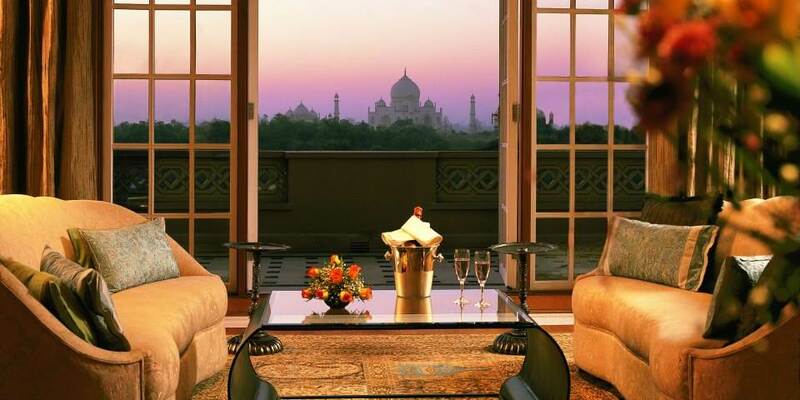 It has the best views of the Taj Mahal in Agra which offers guests the luxury of enjoying the beauty of this monument to love out of visiting hours. Built in a style inspired by Moorish and Moghul architecture, with terraced lawns, fountains and reflection pools it has rich interiors reminiscent of the era of Princes and Emperors. There are two dining options at Amarvilas with Bellevue the main restaurant open for breakfast lunch and dinner featuring International and Indian cuisine. The speciality restaurant Esphahan, open for dinner serves exquisite traditional Indian cuisine. There is a saying that the world is divided into two parts; those who have seen the Taj Mahal and those who have not. Built by the Mughal emperor Shah Jahan as a monument to his beloved wife Mumtaz Mahal, a visit to this iconic beautiful haunting monument is the premier experience for guests staying here. Rise early before dawn, take the electric buggy and enter the Taj Mahal as dawn is breaking. Wonder at her beauty as the sun rises and washes over her, changing the colour of the marble from pink to sparkling white. Make a return visit at dusk and be swept away by her magic in the moonlight. Relax in the peaceful surroundings of Amarvilas, swim in the beautiful cobalt blue pool which is straight from fairy-tale pages of the Arabian nights. The Oberoi spa will take you on a journey of rejuvenation with its unmatched array of therapies designed to renew refresh and replenish the soul. 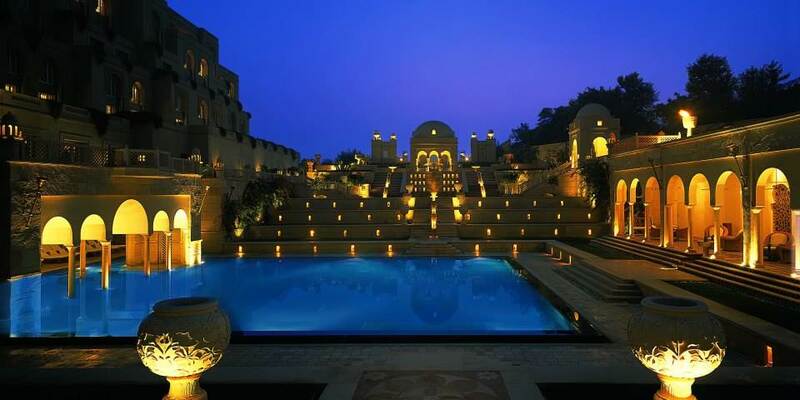 An interlude at The Oberoi Amarvilas will be a truly memorable experience. 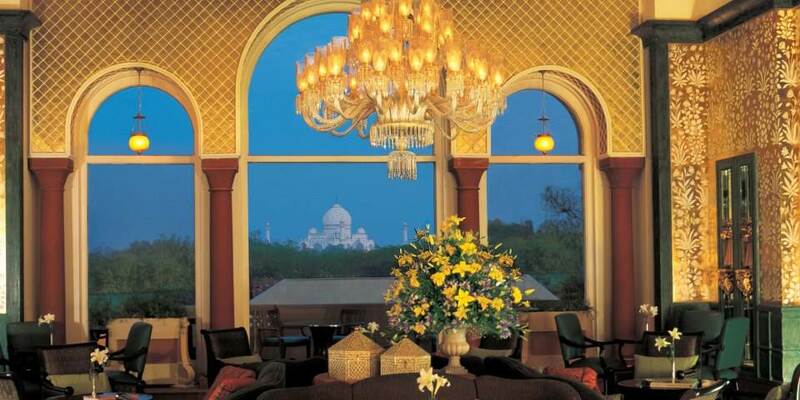 Each of the 106 rooms and suites at Amarvilas has a view of the Taj Mahal. Premier rooms feature Burma Teak flooring, armoires and spacious marble bathrooms with both bathtub and separate shower cubicle. Premier rooms with balcony have all of these facilities but also have their own private terrace with a view of the gardens and Taj Mahal. Deluxe Suites feature separate living room and bedroom and as with the Premier rooms some have the addition of a private terrace. For even more spacious accommodation, and located on the highest floor of the hotel, are the luxury suites. Each has an entrance foyer, separate living and dining room and a spacious bedroom with a four poster bed. Each suite has two private terraces with splendid views of the Taj Mahal; even the bathroom has windows which offer a view to the monument. The jewel in the crown is the Kohinoor Suite, set right in the centre of the 5th floor it has all the facilities of the luxury suite together with a study and a spacious white marble and granite bathroom which has one of the most breath-taking views of the Taj Mahal.